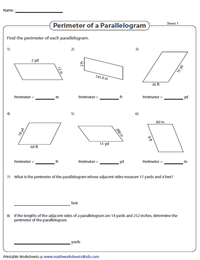 Equip yourself with this assemblage of perimeter of parallelograms worksheets, recommended for grade 4, grade 5 and grade 6 students. Gain an in-depth understanding of the concept with exercises like finding the perimeter of parallelograms involving integers, decimals and fractions, convert to specified units, determine the missing dimensions by solving algebraic expressions and more. Obtain the perimeter of a parallelogram by adding the 'base' and 'side' measures and multiplying by 2. 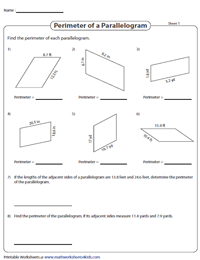 The dimensions are provided as integers ≤ 20, in this set of perimeter of a parallelogram worksheets. 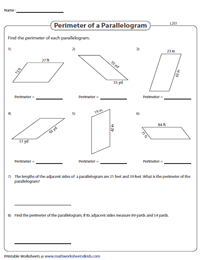 Level up with this batch of worksheets offering problems in word format and as geometrical shapes. Plug in the values of the base and side, given as integers ≥ 10 in the formula P = 2 (l + b) to solve for the perimeter. 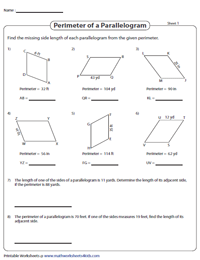 Multiply the sum of the side 'a' and base 'b' by 2, to compute the perimeter of the parallelograms featured in this array of worksheets involving decimal dimensions. 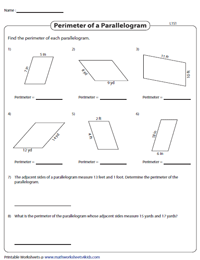 This bundle of fifth and sixth grade perimeter of a parallelogram worksheets provides fractional dimensions. Substitute the values in the formula to find the perimeter, convert to mixed numbers if required. This set requires children to convert the units in the dimensions to the unit specified in the answer. Twice the sum of the base and side provides the perimeter of the parallelogram. 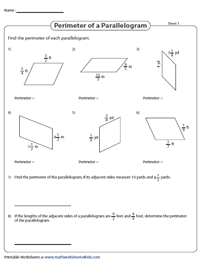 Rearrange the perimeter of a parallelogram formula. Make the missing dimension the subject, plug in the values of the perimeter and the other dimension and solve. The dimensions of the parallelogram are provided as algebraic expressions. Set up an equation using the given perimeter and solve for 'x'. Plug in the value of 'x' in the equation and find the dimensions.